The school has a 1/3 acre playground covered in tarmac and marked out for football and netball. The playground looks onto the fields of Cessnock Farm and down the Cairn Valley. To one side of the playground, just behind the playgroup garden, there is a school garden. There is also a small garden area to the front of the school. 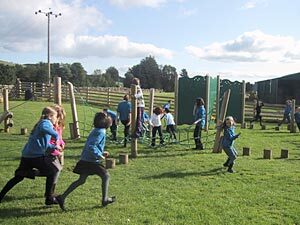 The school also has the use of a grassed area to the east of the school belonging to Robert Wilson, farmer at Marwhirn. The pupils have designed play equipment, shelters and seating for this area. There were several schools in and around Moniaive in the 18th and early 19th centuries. The main building of the current school was built in the 1880s and the area that houses the dining hall, the kitchen and the infants’ classroom was added in 1972.